(Last Updated : 02.05.17). Here is solved question paper 3 of UGC NET English Exam JAN 2017 held on 22.01.2017. This solved question paper solution contains 75 objective type MCQ of Paper-III of English based on official answer key of CBSE NET January 2017 exam. 1. Who among the following is not a diasporic writer? Which of the following best expresses the position stated above? (1) A text is a tissue of lies that has no referential and cultural validity. (2) A text is a communication from the Author-God with multiple meaning. (3) A text is a force field of ambiguity where meanings collapse in the face of opposition. (4) A text is a linguistic construct without any unity of meaning and is linked to multiple sources of language and culture. 5. Which statement best expresses the theme of Coleridge’s “The Rime of the Ancient Mariner”? (1) To kill a living creature is immoral. (2) People should honour and respect all living things. (3) Prayer can accomplish miracles. (4) True harmony is achieved only through cooperative effort. 7. In Tristram Shandy Corporal Trim’s brother Tom describes the oppression of a black servant in a sausage shop in Lisbon that he visited. This episode is inspired by a letter Laurence Sterne received from a black man. Sterne’s reply became an integral part of 18th century abolitionist literature. Name the person who wrote the aforementioned letter to Sterne. 8. In Bertolt Brecht’s Mother Courage and Her Children, which song does Yvette sing to Mother Courage and Kattrin? 9. In Gustave Flaubert’s Madame Bovary, under what pretext does Emma go every week for her clandestine meeting with Leon in Rouen? (1) Under the pretext of going to the church for weekly confession. (2) Under the pretext of meeting her blind friend who lives alone. (3) Under the pretext of weekly shopping. (4) Under the pretext of taking piano lessons. I. a sequence of forty four Petrarchan sonnets. II. a rewriting of Popean didactic verse. III. a depiction of a contemporary setting and small events of ordinary life. IV. a scathing criticism of the British enterprise. 16. What would help a reader recognize Keats’s “To Autimn” as a poem from the Romantic period? 17. Which of the following is an accurate description of ‘heteroglossia’? (1) Heteroglossia makes the job of the novelist easier by incorporating diversity into the novelistic structure. (2) Heteroglossia functions in a novel in alliance with its stylistic system incorporating multiple voices inscribed in social language and differentiated components of a writer’s ideological position. (3) Hteroglossia creates concrete conceptualizations through language in association with the singular view of the artistic effort resulting in the unified world of the novel. (4) Heteroglossia enters the linguistic universe of the novel to homogenize its multiple differences and voices in a singular vision of accomplished structure. 19. Which pair of plays belongs to the early career of Harold Pinter? 20. Who among the following contemporaries of John Donne wrote the following lines on his death: “Here lies a king, that ruled as he thought fit/The universal monarch of wit”? I. Australia is “without songs, architecture, history”. 23. “Britons will never be slaves !” – felt proud Britons in the eighteenth century. A great many Britons, thought, had no qualms about owning slaves and profiting from them. Who among the following British authors self-consciously engaged with the issue of slavery in some poems? 26. In which of the following senses did Marx and Engels originally use the term “ideology” in The German Ideology? (1) Something that mystifies the actual material conditions of society, a sort of the false consciousness. (2) The elaborate structures and institutions that mark the bourgeouse society. (3) The concepts of base and superstructure that govern the economic relations of the society. 27. The plot of this Coetzee novel unravels the narrative of a poor man of colour trying to survive in a civil-war situation, never taking sides. Identify the novel. (4) Life and Times of Michael K.
28. Which of the following lines of T.S. Eliot is used by Anita Desai as the epigraph for her novel, Baumgartner’s Bombay? 29. In the General Prologue to The Canterbury Tales which two characters are examples of deep Christian goodness? 32. Ray Bradbury has titled one of his short story collections – Golden Apples of the Sun – after the last line of a W.B. Yeats poem. Which poem? 33. Which play by Tom Stoppard set in Zurich during the First world War presents a character’s interactions with James Joyce as he was writing Ulysses, Tristran Zara during the rise of Dadaism, and Lenin leading up to the Russian Revolution, all of whom were living in Zurich at that time? In these lines from “Ulysses”, what does Ulysses suggest about Telemachus? (1) He shows heroic qualities. (2) He is patient and selfless. (3) He is very much like his father. (4) He may be too tender-hearted to be king. (1) the London life of hedonistic young men is portrayed. (3) unchaste women, widows and cuckolds scarcely make an appearance. (4) the heroines seek a say in the choice of a marriage partner. 36. What happens to the character Boy at the end of Luigi Pirandello’s play Six Characters in Search of an Author? (1) He drowns in the fountain. (2) He is shot dead by the Father. (3) He leaves the stage alone. 37. Which of the following adjectives will not apply to Becky Sharp, a major character in Vanity Fair? 38. Which character in Anton Chekhov’s play, The Cherry Orchard, first suggests the selling of the orchard? 40. Who identified “strangled articulateness” as a theme in Canadian writing? 43. Aurobindo Ghosh, author of ‘Savitri’, taught for some time at Baroda College after his return from England in 1893. Which subject did he teach? 45. Which among the following does not belong to Indo-European language family? 46. What, among the following, is ruled out by Longinus as a way of achieving the sublime? 47. Who among the following is not a beat writer? 48. This was a masque written by Ben Jonson, staged on Twelfth Night and it was the first masque in which Prince Charles took part. 50. Which chilling novel of surveillance and entrapment had the alternative title Things as They Are? (1) Horace Walpole’s Castle of Otranto. (2) Matthew Gregory Lewis’s The Monk. (3) Thomas Love Peacock’s Nightmare Abbey. (4) William Godwin’s Caleb Williams. 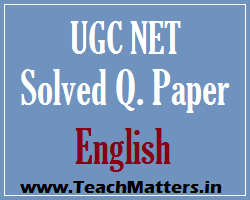 Note : Complete solved paper solution of UGC NET English Paper III JAN 2017 will be uploaded soon.